Century Cycles Blog: National Bike Challenge ends TOMORROW! The National Bike Challenge for 2014 is almost wrapping up! 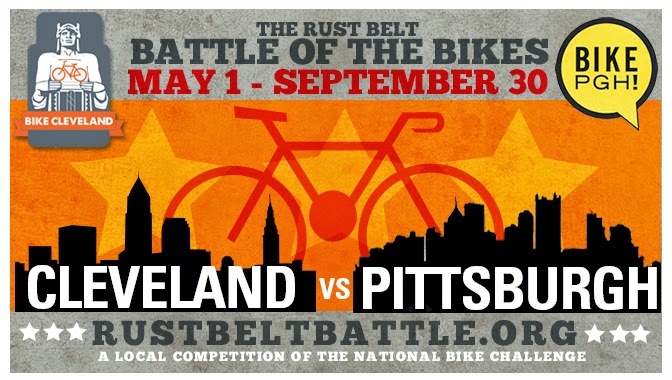 The Rust Belt Battle of the Bikes pits members of Bike Cleveland and any cyclists in the greater Cleveland area against those in the Pittsburgh region. In the first Rust Belt Battle in 2013, Cleveland riders racked up more miles, but Pittsburgh won on a technicality, i.e. more bonus points! You get a point for every mile of cycling that you log, but you get 20 bonus for every day that you ride. You have until the end of the day tomorrow (Sept. 30) to ride and log your miles to be counted in the Challenge. The latest news is the CLE and PGH are neck-and-neck, so every mile and every ride counts! Every ride of at least one mile counts, so even if you don't have time for a long ride, hop on your bike and ride around the block for a mile--that's 21 points for Cleveland!